The moment we've all been waiting for is here. 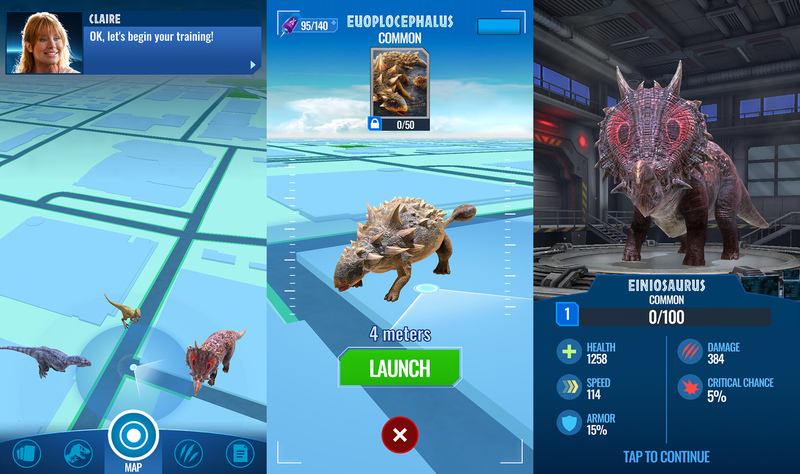 Jurassic World Alive, the dinosaur version of Pokémon Go, is officially available worldwide on Android and iOS today. Jurassic World Alive is a collaboration between Universal Studios and video game developer Ludia. The game was announced earlier this year, and a trailer was also uploaded today on YouTube. If you've ever played Pokémon Go the initial layout of the game will look familiar. Jurassic World Alive links with Google Maps, so once you've given the app location permissions you should be able to see a basic top-down version of your surrounding area. Claire, the same character from the Jurassic World movie series, introduces you to the basic concept of the game. Dinosaurs will pop up on your screen, once you're in range you can click on it, and then launch and pilot a drone to collect DNA samples from the dinosaur so you can create it yourself in the lab. You can only create a specific dinosaur type once you've collected the required amount of DNA from that species, which will often require walking around your neighborhood to find more of that dinosaur. The game doesn't just let you recreate existing dinosaurs, however, similar to the movies you will also be able to create hybrids. Because we all know how well that works out for everyone. Once you've collected at least four dinosaurs you can go out and battle with them, too. Similar to Pokémon Go's Pokéstops, Jurassic World Alive has Supply Drop stations that you can spin every 15 minutes to refill darts and collect coins or cash—or watch an ad to spin again immediately (you can only do this once every 15 minutes, from what we can tell so far). You have to be in range of these stations in order to spin, though, so get walking. Also, fair warning, the game is quite a drain on your phone's battery, so make sure to charge up beforehand or bring a portable charger with you. Jurassic World Alive isn't the only tie-in game for the franchise on the horizon. Jurassic World Evolution, a park builder game for PC, PS4, and Xbox is set to release on June 12 and is now available for preorder. The next installment in the movie franchise, Jurassic World: Fallen Kingdom, releases on June 22.